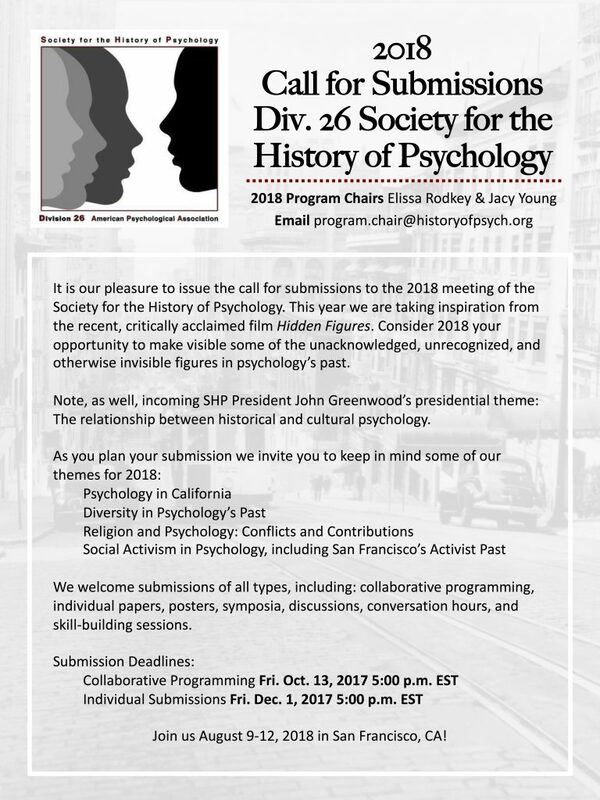 The Society for the History of Psychology (Division 26 of the American Psychological Association) has issued its Call for Submissions for the 2018 meeting in San Francisco, August 9-12th. (Full disclosure: Elissa Rodkey and I are the 2018 Co-Program Chairs.) This year’s theme is Hidden Figures as we hope to highlight some the unacknowledged, unrecognized, or otherwise invisible figures in psychology’s past. Full details, including some of our other themes for 2018, as well as submission deadlines, are included in the full call for submissions below. More details on submissions and the online submission system can be found here. The May issue of History of Psychology is now online. Articles in this issue address the (lack of) health psychology in post-apartheid South Africa , the concept of “active touch” before the work of James Gibson, the Lvov-Warsaw School of historical psychology, and the teaching of the history of psychology in Spain. Two further articles contribute to the digital history of psychology: John Benjamin offers a Zipfian analysis of the anglophone vocabulary of psychology, while Michael Pettit argues for caution in using the Google Books Ngram Viewer as a means of assessing cultural change over time. Full titles, authors, and abstracts follow below. As part of a growing literature on the histories of psychology in the Global South, this article outlines some historical developments in South African psychologists’ engagement with the problem of “health.” Alongside movements to formalize and professionalize a U.S.-style “health psychology” in the 1990s, there arose a parallel, eclectic, and more or less critical psychology that contested the meaning and determinants of health, transgressed disciplinary boundaries, and opposed the responsibilization of illness implicit in much health psychological theorizing and neoliberal discourse. This disciplinary bifurcation characterized South African work well into the postapartheid era, but ideological distinctions have receded in recent years under a new regime of knowledge production in thrall to the demands of the global market. The article outlines some of the historical-political roots of key trends in psychologists’ work on health in South Africa, examining the conditions that have impinged on its directions and priorities. It raises questions about the future trajectories of psychological research on health after 20 years of democracy, and argues that there currently is no “health psychology” in South Africa, and that the discipline is the better for it. The February 2015 issue of History of the Human Sciences is now online. Included in this issue are articles on educational reformers’ promotion of brain sciences in Third Republic France, shifting attention in linguistics to “living” language in Imperial Germany, the cultural psychology of Giambattista Vico, and much more. Full titles, authors, and abstracts follow below. During the influx of neurological research into France from across Europe that took place rapidly in the late 19th century, the philosophy course in lycées (the French equivalent of high schools) was mobilized by education reformers as a means of promulgating the emergent brain sciences and simultaneously steering their cultural resonance. I contend that these linked prongs of philosophy’s public mission under the Third Republic reconciled contradictory pressures to advance the nation’s scientific prowess following its defeat in the Franco-Prussian war of 1870 without dropping France’s distinct tradition of 19th-century spiritualism, which extended from Maine de Biran’s philosophical psychology to Victor Cousin’s official eclectic spiritualism. Between 1874 and 1902, the French Ministry of Public Instruction transformed philosophy into a national project designed to guide the reception of experimental psychology generally and neurology in particular. This article features original archival research on philosophy textbooks and students’ course notes that illuminate the cultural and intellectual impact of these sciences in the fin de siècle from inside the classroom. I argue that the scientific turn in the psychology section of the lycée philosophy course reflected and brought about a distinct philosophical movement that I call ‘scientific spiritualism’. While historians have analysed philosophy instruction as a mechanism used by the Third Republic to secularize students, this article sheds new light on lycée philosophy professors’ campaign to promote scientific spiritualism as a means to advance incipient brain research and pare its reductionist implications.